After WWII, Americans’ lives were shaped by economic, political, social and cultural structures premised on the notion that mass consumption would bring widespread prosperity and social equality. In an ideal America, mass consumption would “provide jobs, purchasing power, and investment dollars, while also allowing Americans to live better than ever before, participate in political decision-making on an equal footing with their similarly prospering neighbors, and to exercise their cherished freedoms by making independent choices in markets and politics.” Although the postwar era offered a period of unprecedented affluence and encouraged certain forms of political activism, Bancroft Prize-winning historian Cohen (Making a New Deal) powerfully illustrates the consumer culture’s failures in terms of social egalitarianism. The postwar housing shortage spawned suburbs that starkly emphasized class and racial differences; well-intentioned innovations, such as the G I bill, had little impact on women, working-class men and African-Americans; targeted marketing segmented citizens along class, gender, age, race and ethnic lines, accentuating divisions and undermining commonalities; and economic inequality expanded greatly during the past three decades. Cohen’s sharp and incisive history particularly highlights the struggles of blacks seeking civil rights and women pursuing greater representation within the republic, illuminating the ways that mass consumption both helped and hindered their progress. 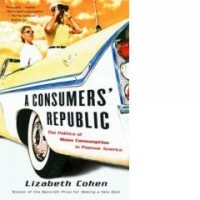 Ultimately, Cohen asks whether mass consumption has successfully created a more egalitarian and democratic American society. The answer is balanced, judicious and laced with suggestions for how American citizens can begin to articulate a common vision for the future, even as the nation’s population grows ever more diverse. 64 illus., 3 maps.